Late Blight Control in Tomatoes: The Loss of Mancozeb | Chatham-Kent Agriculture Development | We Grow For the World! The Pest Management Regulatory Agency recently announced that it will be cancelling the use of the group M3 chemicals mancozeb and metiram in a wide range of crops, including field tomatoes. In 2020 products like Manzate, Penncozeb, Dithane and Polyram will no longer be available for sale and in 2021 use will be banned completely. This will ultimately have an effect on how we control diseases, including anthracnose, early blight and, most importantly, late blight. Although mancozeb is currently an important player in fungicide programs, tomato growers do have other options available. For best control it is always good to start with preventative or protectant fungicides once environmental conditions are conducive to disease development and before symptoms appear. Once you begin to see late blight in the crop, adding products that are better as curatives is imperative. For a list of products and their efficacy on late blight as protectants, curatives and antisporulants click here. 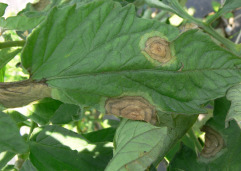 For a product list and efficacy regarding anthracnose and early blight click here. Remember, it is critical to rotate chemical families in your fungicide program. Resistance to certain chemicals or entire chemical groups is becoming more of an issue and rotation can help to maintain the efficacy of these products over a longer period of time.